ST. PETERSBURG, FL—September 16, 2014—C&D Printing has installed a new Kluge OmniFold Folding and Gluing System. The OmniFold was purchased to increase C&D Printing’s capacity and capability in folding carton work, allowing them to convert presentation folders, specialized paperboard packaging, including tuck-style, push-lock and auto-lock bottom boxes, sleeves and various other products. The OmniFold serving C&D Printing is configured with both a vacuum feeder and a friction feeder to feed the widest variety of substrates, shapes and sizes and Kluge’s combination angled and vertical buckle fold unit for quality, high-speed crossfolds on both light and heavy weight stock. The OmniFold is designed for production environments with its ease of makereadies, flexibility in applications, and tremendous expansion potential with its modular design with production speeds ranging from 6,000 pph to 30,000 pph. C&D Printing, in business for over 41 years, is an integrated graphic, marketing, and packaging solutions company which provides commercial printing, on demand digital printing, creative design, digital prepress, inventory management, complete bindery, mailing and print finishing services in the Tampa Bay area and across the United States. C&D is well known and respected for its quality, customer service, and commitment to the environment. 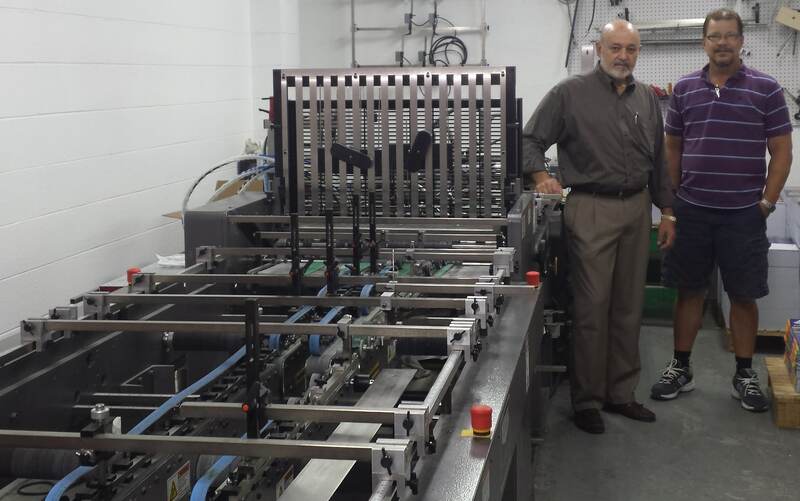 Bill Serata, Owner (left) and Todd Pemberton, Letterpress and Finishing Manager (right), stand next to C&D Printing’s new Kluge OmniFold Folding and Gluing System.